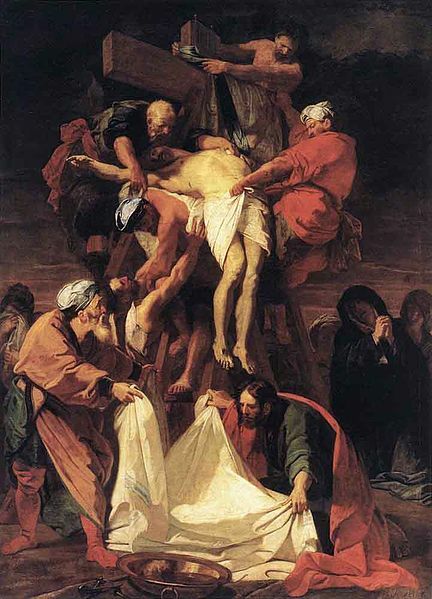 Above is a painting by Jean-Baptiste Jouvenet entitled Descent From the Cross. For the Christian church, we identify this week as the most important week in the history of humankind – Holy Week. In particular, we have Maundy Thursday, focused on the Last Supper of Christ with the twelve. This is followed by Good Friday, whereas Christ is sacrificed upon the cross for humanity’s sin. Next we have Holy Saturday (or Silent Saturday), a day that many evangelicals might not call to mind, the day that lies between the death and resurrection of Christ. Lastly, we have Easter Sunday, the day of celebrating Christ’s defeat over death through resurrection. I want to examine something that often gets taught and preached about Christ’s death on the cross. While it seems this perspective would be true, I think it falls short of the full story of Scripture. We all know those quoted words of Christ as he hung on the cross – My God, my God, why have you forsaken me? And those words need to settle upon us. by night, but I find no rest. Again, those words need to sit with us – at least for Friday and Saturday. Perhaps we should guard from proclaiming, “Sunday is here,” if we have not yet felt the weight of Friday and Saturday as those first followers did. Death, confusion, pain, silence – they all have their place in the Christian life. Remember, resurrection cannot be attained unless there is death. But do we know what Psalm 22 says? When the Jews quoted Scripture, it wasn’t so much about quoting a single verse here or there to prove a point. Normally, the reference was to bring to mind a larger context, a fuller setting. It’s not unlike someone quoting a well-known verse today. I bet most could complete the statement. We would follow with the words – …and the word was with God and the word was God. You would complete the statement with – …the world that he gave his one and only Son that whoever believes in him shall not perish but have everlasting life. With no printing press so long ago, Jews had to really learn the Scriptures. And learn them well. So for Christ to quote the beginning of Psalm 22 as he hung upon that tree, he was not simply bringing to mind one part of one verse. Rather, the full psalm was being invoked. But what does that complete psalm say (and it’s a longer one)? Take a moment to read it. And perhaps note vs19 and following. Note that the prayer is heard. Note the fruit that would follow. The person who makes this prayer, originally David, tells us they will not be despised and scorned. A listening ear has been given to this prayer. Not only that, but praise, worship, justice, righteousness and salvation will follow. Not an ethereal salvation for the clouds. But the deliverance of God on behalf of his anointed. This ancient, prayerful song tells us a story. A story that begins with death and silence, but ends in deliverance and justice. And this is where the rubber meets the road. This psalm, the entire psalm, was played out over that weekend – including the fact that Christ was raised from the dead by the power of the Spirit. This is where the cry of Psalm 22 is headed. That’s what the song is ultimately about, even in the midst of felt abandonment. So, this is where we get it wrong. When we say that the cross was the only time the Father turned his back on the Son, largely because that is the moment when Christ took on the sin of humanity, we proclaim something that is not true. Psalm 22 does not teach that the Father abandoned Jesus, the Son, just as it does not teach God abandoned David, his son. David felt it, hence his cry to begin the psalm. And David was the original anointed one (“messiah,” literally). Jesus, as God’s great Messiah fulfilling the story of Scripture, rightly invokes Psalm 22 as descriptive of his own situation. It makes for good preaching to tell the Father abandoned the Son, I suppose. It falls short of what the text actually teaches. Men bloodied Jesus. The Father was at work. That’s the great message of Psalm 22. And a proclamation of forgiveness all the while coming from the lips of Jesus: Father forgive them, for they know not what they do. And what of us, those who put their trust in their God? We can look to our good Father for vindication, truth, justice, deliverance, and forgiveness – even the courage of forgiveness toward our own enemies. Weakness will be turned to strength in the hands of God. Foolishness will be turned to wisdom in the hand of God. Death will be turned to life in the hands of God. Violence will be turned into forgiveness. It is a good thing that never the Father turned his back on his Son. It is a good thing that never the Father turns his back on his children. This entry was tagged cross, Easter, Jesus. Bookmark the permalink. This is truly good news. Did you know that the words of Christ book-end Ps. 22? “My God, my God…” is the first verse. “It is finished” is another way of saying the last line of the last verse. I can’t believe that people thought that God abandoned His Son. Great article Scott, thanks for sharing!